Today we experienced a Costa Rica hurricane or something very close to it! All I know is, it was pretty much a disaster and we had to jump into emergency mode to deal with it before everything in our house got wet! So we were out working on the drainage ditch next to our driveway when it started raining. Seemed like any other rainy day… We packed up our shovels and walked back to the house. We stood on the porch and watched the rain and it began to blow from the west to the point we couldn’t stand anywhere on our west-facing porch without getting wet. We decided to leave some of the saran up to block the rain but we noted that if it got windier we might have to roll it up or the wind might be too strong and blow it down and it could hit the windows. We have this saran on our porch, which we can roll down to block the afternoon sun. So we went inside to stay dry and kept an eye on the saran. A few minutes later the wind got stronger and the rain got stronger and even though I knew I would get completely soaked now if I rolled it up, I would have to go out and roll it up. I did so and the rain was strong but the wind was stronger and I had a hard time getting it rolled up as the wind was so strong it was blowing it and I had a hard time holding on to it! I’ve seen some rain storms here but this was more like a Costa Rica hurricane or tropical storm than just a normal rain storm. Meanwhile the rain was drenching me and I was soaked from head to toe and I could barely see through my glasses and even with my glasses the wind was beating the rain against my eyes and hurting them. If this wasn’t a Costa Rica hurricane it was something akin to one! I finally got it done and went inside. My shoes were so wet it was if they had been dumped in a bucket of water, and all my clothes were drenched and soaked. I took a hot shower to recover with plans to dry off, and lay down with my Kindle and read for awhile. “The jalousies in the bedroom.” (Jalousies are the slatted windows where you open the slats with a handle on the side.) Our jalousies are way up toward our high ceiling and if water is coming in there I knew it may be blowing onto the beds. I sprang into action at this point and quickly dried myself off (little did I know it would do me no good to dry myself) and went to the bedroom to take stock of the bedroom. I looked up and I couldn’t see where the water was coming in but I could feel it. Basically it felt like it was raining! In the living room! I then looked at the bedroom and saw water falling in there as well, the whole wall under the jalousies way up top (we have a high ceiling in there) full of water where it was leaking in through the windows and falling down along the wall to the floor, and also coming in with the wind, onto the bed. As I stepped out of the bedroom I could now see puddles of water all over the living room and kitchen as well as the bedroom the water was also coming in through some spaces under and at the side of the front door. This was going to be a major fix and clean up! 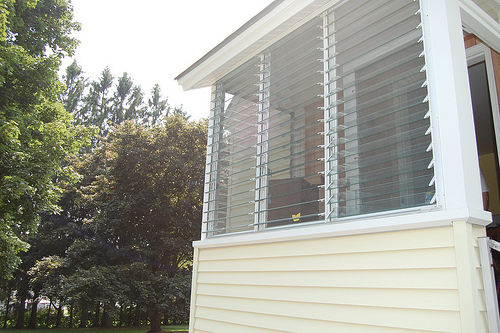 This is an example of a jalousie window. I didn’t get a photo of ours but we have two only and smaller than these, way at the top of our high wall facing the bed. There is some space between each slat even when closed and so the high wind was blowing the rain in through these spaces. I went outside. Got soaking wet again. Dragged in the muddy ladder into the bedroom, and climbed up the 14 foot ladder and stood on the next to the top rung to have a look. The ladder was wet and slippery, my shoes were muddy, the rungs were muddy and the way I had to put the ladder against the wall made it steeper than is safe to climb on, probably 20 degrees or so, and so standing high up on the next to top rung didn’t give me a good safe feeling. She threw me up some hand towels and I figured out a way to lace them through the slats in the windows and tuck them into the space at the bottom of the last slat to hopefully block out the rain. After some experimenting and with no small effort, I got one done, climbed down, moved the ladder and climbed back up to the other one 5 feet or so away. This was scary because of the steep angle of the ladder, the slipperiness and the height. I told Joanie, “I really hope I don’t fall and break my neck or back!” I was truly concerned that I might. But this was one of those situations where you just “have to do what you have to do” and hope for the best. I was able to pretty well seal the other window, though if we get a lot more wind, and rain, all bets are off as to whether they hold or if they fill up with water and leak down the wall anyway. After I finished that I went out to the living room and realized we had to start mopping up water. But the mop was outside. Once again I went out and got soaking wet getting the mop and then had to come in and wring it out in the shower and start mopping. Joanie is not good in emergencies. She seemed lost as to what to do and I had to tell her to find a towel and start helping me mop up all this water! First I mopped in front of the door and put a dry towel there to prevent further water from flooding in. To her credit Joanie had put a towel there but it was now full of water and I also had to put one where the water was flowing from there under the kitchen cabinet. Well, we spent about two hours mopping up water and mud and the rain slowed down, and the wind stopped blowing so hard. At least for awhile. It IS still raining though! We will have to replace the jalousie windows with regular glass or storm glass, and not have the ability to open them. I do NOT want to go through THIS again! In the meantime, tomorrow, if it’s not raining or blowing too hard I will climb up on the roof and attach several trash bags with nails – or something! – to seal off the windows and hope they don’t come loose in the wind or rain. Hopefully we can get someone out within a few days to install the small glass windows and throw out these lousy quality and poorly installed jalousies! So: Whew! Our first real emergency since living here, now almost a year. It could have been much worse, of course, but when you’re in the middle of it, it seems pretty bad. Was this a Costa Rica hurricane? I have never been in a hurricane so I don’t know. All I know is, there was a very strong wind and a lot of rain! So this Costa Rica hurricane or whatever it was – tropical storm, wind and rain storm, whatever you want to call it! – was quite upsetting and we definitely had a lot of adrenaline rushing there for quite a while. I am currently sitting down and having a beer to relax me a bit. Apparently – I just checked some web sites – a true Costa Rica hurricane is rare and we just have “tropical storms” here. Whatever it is, tropical storm or Costa Rica hurricane, I can do without any more of them! Ahh, great idea! Except that the windows in question are high up above the porch, accessible only by a ladder to the roof then walking across the roof! A design flaw, for sure! 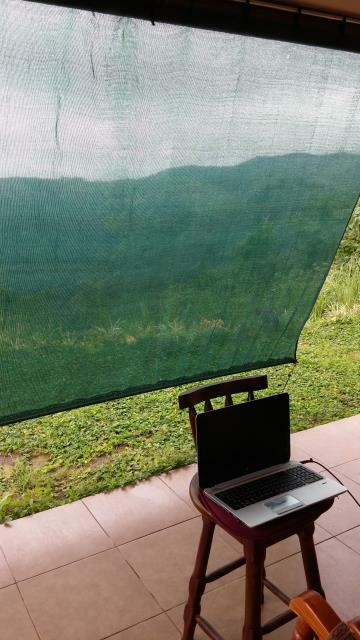 All windows should be easily accessible from the outside in a rainy country with tropical storms!